YEREVAN. 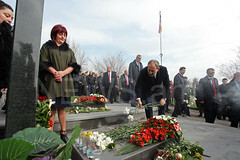 – Georgian president Giorgi Margvelashvili visited Memorial to the Armenian Genocide victims, accompanied by the high-ranking officials of Armenia and Georgia, . The Georgian delegation paid a tribute to the victims of the Armenian genocide and put flowers at the memorial of the Armenian genocide. 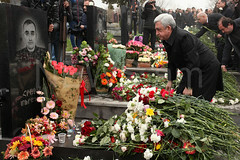 At the end of the official visit President Margvelashvili planted a fir at the Memorial Alley of Tsitsernakaberd Memorial Complex.